Hi everyone! Happy 1st day of fall! I am hoping that now it is officially fall the weather will start to cooperate too! It feels like the middle of summer. 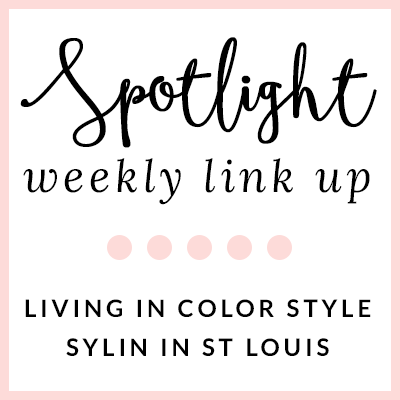 This week's spotlight weekly is about layers! Come share you layered looks with Elle and I! 1. 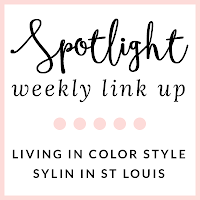 We kindly ask that you follow the two hosts: Elle from Living in Color Style, Jacqueline from Stylin' In St. Louis, and our guest host Katrina of Every Super Woman. 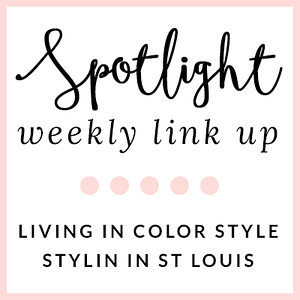 Spotlight: Our spotlight of the week is Laura of I do deClaire! We love Laura's take on plaid! Her white blouse is such a great plaid and looks perfect with her moto jacket! Be sure to check out her blog! Next week: Next week our spotlight week theme is black! Thanks for linking up! See you next week! Sooo chic and preppy! Love it and your pony tail rocks!!! Love your blazer and the amazing Prada sunnies! Love all of the details! Cute, classic look! 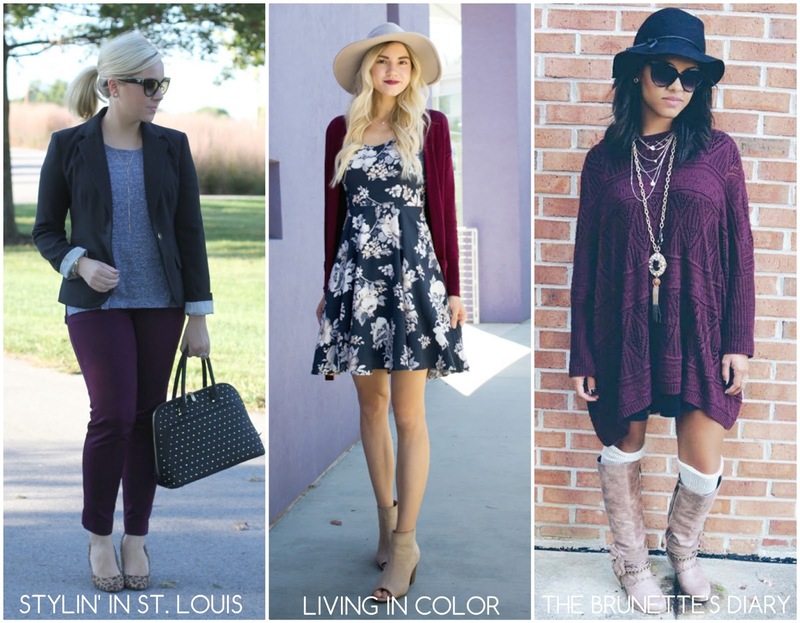 Love this perfect fall look! Love this cool + classic blazer, babe! Great fall look! Love those pants! Lovely Fall look you put together!!! 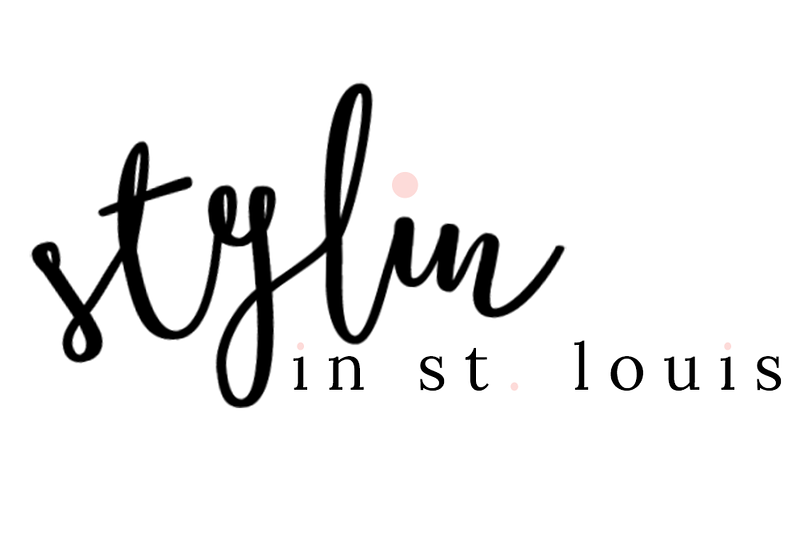 I am launching another 3-part collaboration with fashion forward brand STAYING SUMMER this week at the blog - come on over and lemme know what you think! Such a pretty fall look!! Love this neutral combo! That delicate necklace is perfect against the grey top! Love the jewelry pieces for this look! Ok, where do I start... The color of your pants is beautiful, love your bag and obsessed with those earrings! Head to toe gorge. Love those wine colored pants, especially with the blazer! Happy first day of Fall! 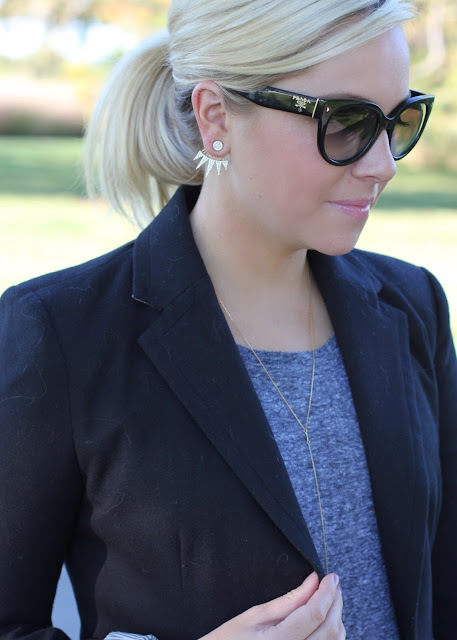 I love layering, especially with a black blazer! So versatile! Great leopard touch with your heels, Jacqueline! Great look...classic and edgy at the same time. Love those earrings!! This is such a great work outfit! Love the animal print pumps and those amazing ear jackets! Absolutely LOVE that blazer!! Perfect work look!